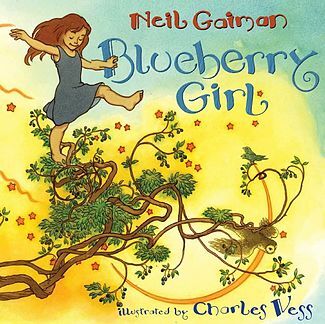 Ladies of light and ladies of darkness and ladies of never-you-mind, this is a prayer for a blueberry girl. First may you ladies be kind. Keep her from spindles and sleeps at sixteen, let her stay waking and wise. Nightmares at three or bad husbands at thirty, dull days at forty, false friends at fifteen. Let her have brave days and truth, let her go places that we’ve never been, trust and delight in her youth. Ladies of grace and ladies of favor and ladies of merciful night, this is a prayer for a blueberry girl. Words can be worrisome, people complex, motives and manners unclear, grant her the wisdom to choose her path right, free from unkindness and fear. Let her tell stories and dance in the rain, sommersaults, tumble and run, her joys must be high as her sorrows are deep. Let her grow like a weed in the sun. Ladies of paradox, ladies of measure, ladies of shadows that fall, this is a prayer for a blueberry girl. Words written clear on the wall. Help her to help herself, help her to stand, help her to lose and to find. Teach her we’re only as big as our dreams. Show her that fortune is blind. Thruth is a thing she must find for herself, precious and rare as a pearl. Give her all these and a little bit more: gifts for a blueberry girl. Virker som en flott bok:) Den teksten var fin! Liker navnet, Blueberry girl. Likte forsåvidt utdragene også, men jeg har av en eller annen grunn en iboende skepsis mot Neil Gaiman. Så rart 🙂 Hva er det du synes er “galt” med ham eller hvordan vil du uttrykke det?